Read through the Bible in less than one year by reading 10 chapters a day from 10 different sections of the Bible using the Professor Grant Horner Bible reading plan. I’ve also designed three different styles of bookmarks to use with this method of Scripture reading. Scroll down to see them. For many years my husband and I would do a Bible study together every morning before he left for work. But then he got a job which required him to leave home too early in the mornings. So while we could still continue to do our study together on the weekends, I had to do a Bible reading on my own on weekdays. At that time (five or six years ago), I came across a website talking about the Professor Grant Horner Bible reading plan where you read ten chapters a day from various sections of the Bible. I had read the Bible all the way through a few times, but decided that I needed the challenge to do it again. My children were grown and were not demanding of my time, so I have been able to use this system, or my own slightly modified version of it, on and off, for several years now. 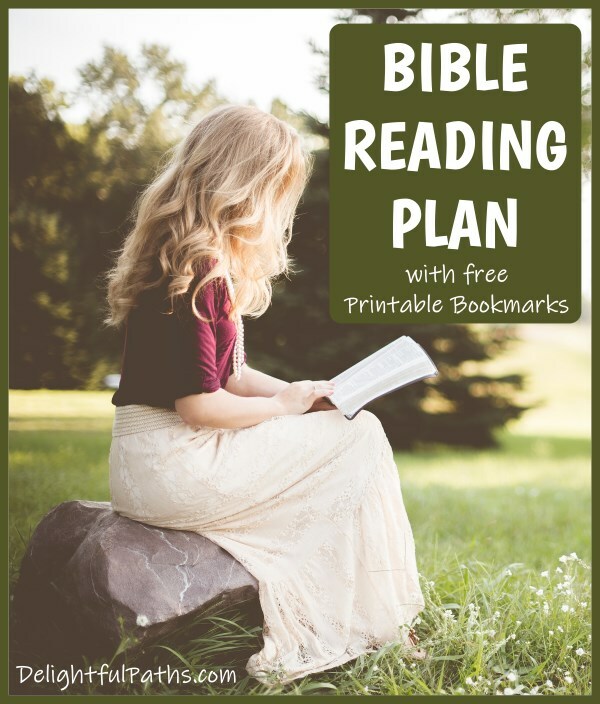 This is a great Bible reading plan for beginners but more mature believers will also love it. With the Professor Grant Horner Bible reading plan, you read through ten chapters a day, one from each of ten different sections of the Bible. So on the first day, you read Matthew chapter 1, Genesis chapter 1, Romans 1, 1 Thessalonians 1, Job 1, Psalm 1, Proverbs 1, Joshua 1, Isaiah 1, and Acts chapter 1. 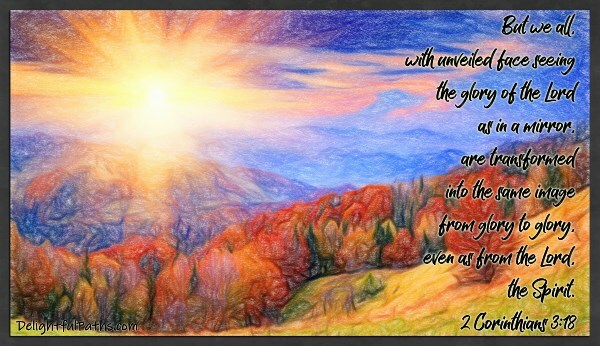 Then on day two, you read Matthew chapter 2, Genesis chapter 2, Romans chapter 2, … well you get the idea! You continue reading through the books from each section, rotating back to the beginning of the list once you reach the end. This means that on day 29, you will continue reading the Bible chapters from where you are up to, but you will go back to Acts chapter 1 because you have reached the end of that list. And so on day 90, you will have read Acts three times through, will be starting to read Matthew again for the second time, and will be reading the last chapter of Exodus for the first time. Professor Horner recommends using one Bible and sticking to it. That way you will get to memorize where things are on the page. If you want to do this, you will need to make sure that you are using a translation that you like. It is also important to get a Bible with a sturdy cover and binding, and to have a format that you like (eg do you prefer one or two columns; do you like to see the verses in paragraphs or on individual lines etc). 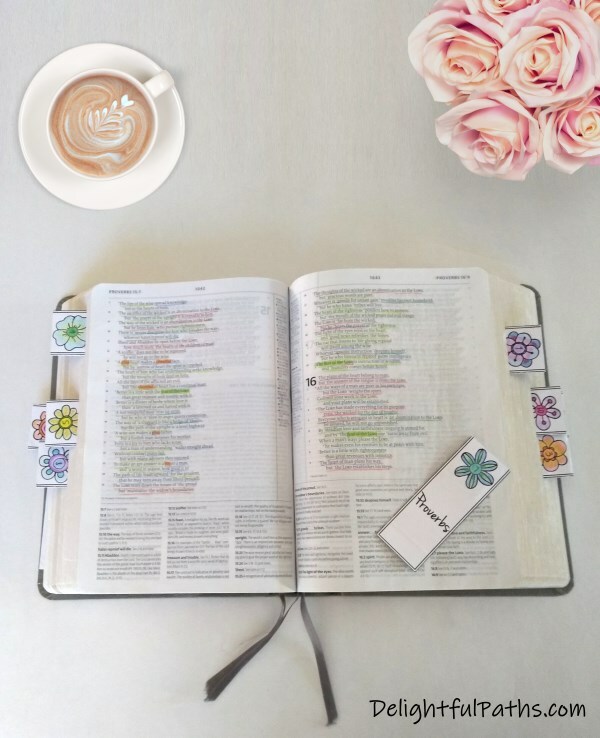 Bookmarks are really handy (actually, essential) with this Bible reading method! 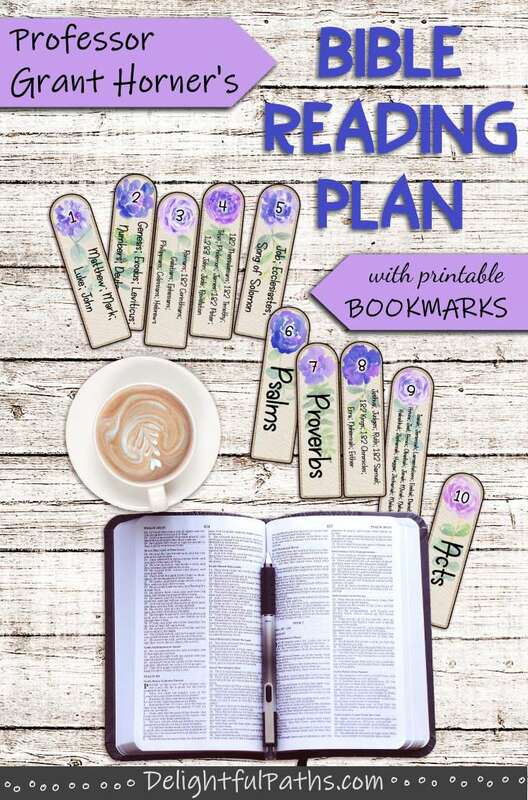 So I have created some free printable bookmarks which you can access in my resource library (see below for how to get access). It will be easier for you to find passages in your Bible as you get more familiar with your own Bible. You will be inspired to walk in a way worthy of your calling by reading a couple of chapters from the New Testament letters each day. The longest list, the prophets, is only 250 chapters (or 250 days) so even allowing for some missed days, you should be able to read the Bible in a year. And last, but not least, my favorite benefit – You will find that as you cycle through each of these sections, because they are all different in length, you will never end up reading the same combination of chapters. This means you will often find verses from one section making something more clear from another section – Scripture interpreting Scripture. Even though the Bible has been written over a period of some 1500 years, because God is the author and he inspired the authors of individual books, we shouldn’t be surprised at how many times we will find Scriptures tying together and shedding more light on other scriptures as we read. Try out this system for 30 days and see how you go. Isn’t that a lot of reading? Well, yes. But in the Professor Grant Horner Bible reading plan, the idea is just to read and not do any in-depth studies as you read. I find that I can read the ten chapters in 30-40 minutes (sometimes it will be a little longer if the day’s reading includes one or more really long chapters). Even without doing an “in-depth” study, you will find that you will be getting a good idea of the big picture of the Bible. Remember that your goal should not be to “get through” your reading, but to learn. And we are not just filling our heads with knowledge, because as we grow in our knowledge of the Lord, his word transforms us. Maybe try reading only five chapters a day. Read sections 1-5 on one day, then alternate on the next day and read sections 6-10. Read nine chapters per day: read sections 1-6 and 8-9 and alternate between Proverbs and Acts. You could either read the whole book then switch to the other or switch between books every second day. You may find that it is easier to read, say, five chapters in the morning and five chapters in the evening. At the moment, I am doing a modified Horner Bible reading plan – I have cut back to eight chapters a day – I have incorporated #10 (Acts) in with #1 (the gospels) and #7 (Proverbs) in with #5 (wisdom literature) because I have a new(ish) Bible and I take a bit of extra time in color coding the Bible – one or two chapters a day. If your goal is to read the Bible in six months, you could read twelve chapters a day, doubling up on the Old Testament history and the prophets sections. You will also need to read a few extra chapters in the Law section to achieve this goal. 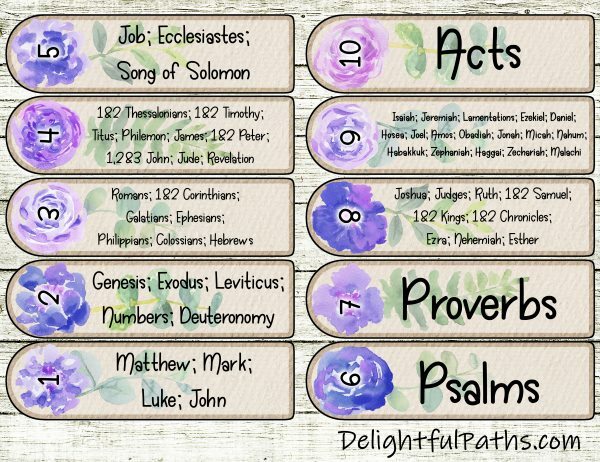 To help you keep track of where you’re up to in each section, I’ve designed three sets of pretty bookmarks to use in your Bible – two set of coloring bookmarks and one with purple and pink watercolor flowers. Print them out on card so they will be more durable. With the black and white ones, you can color them or just leave them as they are. The top set in the picture above is designed to include magnets so the bookmark can snap shut and stay in place. This is the set that I use. I clip them over the side of the page to mark the chapter I’m up to. This is helpful especially when there is more than one chapter on that page. The paper in my Bible is quite thin, so I find it better not to have the bookmarks sticking out too much, putting pressure on the pages. Because these bookmarks are printable, when they wear out (as they inevitably will! ), you can just print them out again. Easy! Subscribe (free!) 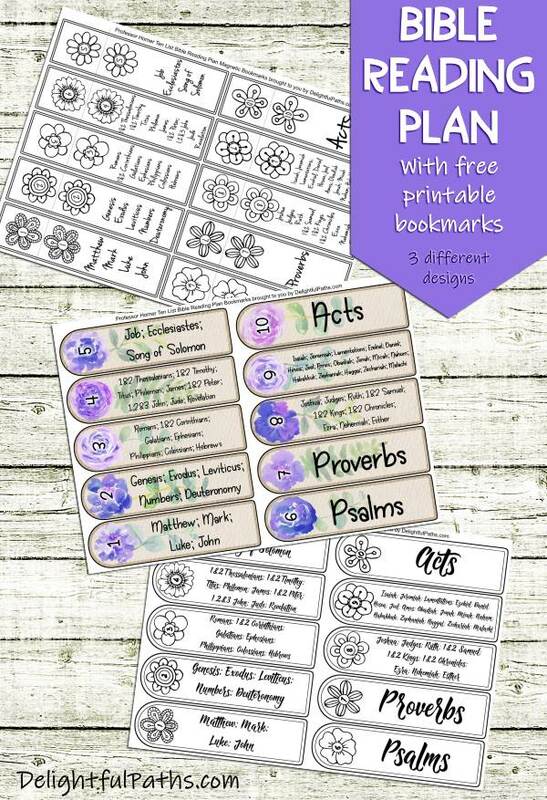 to get access to the printable bookmarks (as well as my whole resource library with all my coloring crafts and printables!) Once subscribed, I will send you a semi-regular newsletter with details about my new free files, occasional offers, and other things you may be interested in. If you have enjoyed reading this post, could you do me a favor? Please post a comment and let me know what you think. Please also share this blog with your social network. I appreciate it! This has been one of my favorite plans. It is one I return to regularly. Are you still using the plan? If so, what have your thoughts been? I love most everything about it, except that for longer books and parts I am not familiar with, I feel like the flow is sometimes broken up. Have you felt the same, or do you feel that, over time, you start getting the feeling of the flow of the larger and less-known books as well? The other plan I go with is just reading for a set time each day to read through the Bible, but you can get “bogged down” in certain parts, as you stated. The upside is that the internal flow of a book is maintained since you are reading it more like a normal book. I am still using the plan, but I am pretty flexible. That’s one of the great things about this plan – you don’t get “behind” if you miss some days. Your bookmarks keep track of where you are up to. Sometimes I feel that I’d like to read a book as a whole or at least, in bigger chunks, and not just one chapter per day (to get a better flow of that one book) and I think this plan is adaptable enough for this. Just recently I decided to read the whole book of Amos in a couple of days (for a Bible course I was doing), so I just cut back on some of the other sections I was reading. The bible app “YouVersion” has a number of bible reading plans within it. Prof. Horner’s is one of these plans. You can just click and read (it keeps track for you) and if you choose a bible translation with a read aloud option, you can follow along as the verses are read to you by the reader. I like this although you don’t get the benefit of increased familiarity with your own bible. But I will remain more consistant in followthrough. Thanks Carole. That sounds interesting. I’ll have to go check it out!